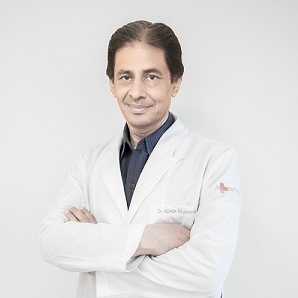 Dr. Ashok Rajgopal is an acknowledged orthopaedic surgeon with over 32 years of experience in knee surgery along with vast experience of trauma surgery as well. A PadmaShri recipient, Dr. Ashok Rajgopal was appointed Honorary Orthopaedic Surgeon to the then President of India, in 1997. Dr. Ashok Rajgopal has played a key role in the designing of the PERSONA Knee system. Dr. Rajgopal has helped sportsperson of international repute like P. Gopichand (Badminton), Sushil Kumar(wrestling), Baichung Bhutia (Football) successfully recover from knee related sports injuries. Dr. Ashok Rajgopal is one of the best Orthopedic Surgeons in Gurgaon and has an experience of over 32 years. He possesses impeccable expertise in the most advanced orthopaedic surgeries. Dr. Rajgopal holds the unique distinction of performing 28 Total Knee Replacement surgeries in under 12 hours and has completed 25,000 Total Knee Replacement surgeries in thirty years of practice. Dr. Ashok Rajgopal has performed the first cement less implants such as Trabecular Metal implants, the first Bilateral Total Knee Replacement surgery and the first MIS Unicompartmental surgery. He also became the first orthopaedic surgeon in India who has carried virtual total knee replacement employing patient-specific instruments. Dr. Rajgopal has been awarded the Honorary FRCS by the Royal College of Surgeons 11 Mar,2011. He was awarded the Padmashri by the President of India on the eve of our 65th Republic Day on 25th Jan, 2014. MBBS - Pune University, India. M.S. (Orth) - All India Institute of Medical Sciences, New Delhi. M.Ch. (Orth) - University of Liverpool. F.R.C.S. (Edinburgh). Harden up bones with soft yogurt, keep osteoporosis at bay. Supple spine and you have nothing to whine! Knee Replacement Surgery: Partial or Total? Arthroscopy v/s Arthroplasty: Which is the right option for a hip replacement?